I recently spent the day in Yemen. Not something your average American would contemplate doing these days. It’s not even something simple to do as the embassies here in the United States won’t issue tourism visas. In order to go, you have to find a travel agency to sponsor you and do the paperwork for entry visas and receive your full visas upon arrival at the airport. We visited Sana’a, Yemen, as a break from our travels in Djibouti. Our host was Arabian Voyages Travel (www.ArabianVoyages.com). We literally spent a day. An unfortunately timed day as an American drone strike had happened about 48 hours before coloring some Yemeni opinions about Americans and our foreign policy. My friends used words like ‘courageous’ and ‘brave’ when discussing my plans. I wondered if ‘naive’ and ‘stupid’ might be a better fit. The Yemen day trip was completely the brainchild of my traveling companion who thought 1. a week in Djibouti could get monotonous (he was wrong, I think I could stay there forever) and 2. I needed to see old Sana’a, one of the oldest living cities in the world inhabited for about 2500 years (he was right). Air Yemenia proved to have the smoothest flight out of the multiple plane trips I took that week. I have issues with my ears and the pressurization of aircraft and Air Yemenia caused me the least discomfort. Plus, they provided a light meal service on a flight only 45 minutes long. Those flight attendants really hustled. Our entry into Yemen went smoothly, and our guide, Mohammed, met us at the airport door. It was about 11 p.m. so I don’t think the reality of culture shock had set in, though the difference in language intimidated me. In Djibouti, one hears French, Arabic, Somali and occasionally English. 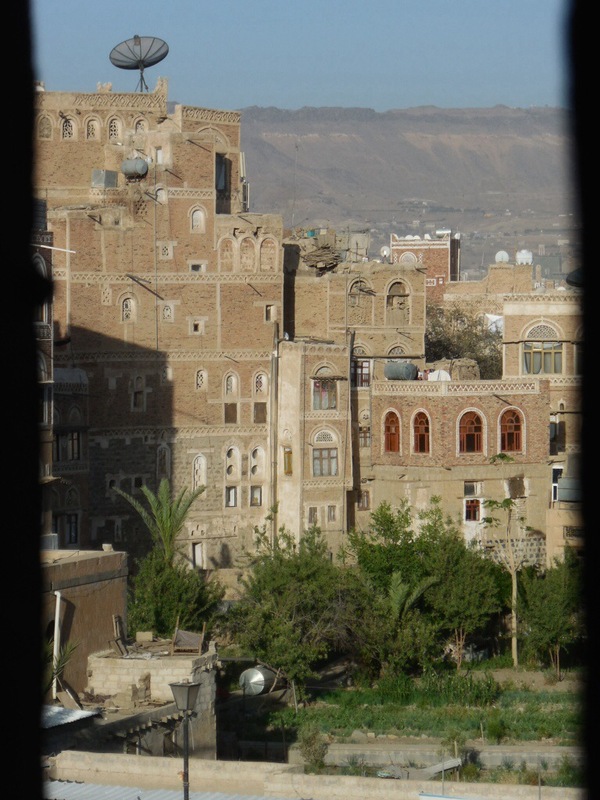 Yemen was the first place I ever visited where I did not speak the language. We climbed into a small white taxi, listening to local music as we drove through Sana’a. Mohammed passed us each a bottle of cold water as he and my companion discussed our visit, the recent drone strike and kidnappings. It was during that car ride that it was suggested that if anyone spoke to us, we should claim to be Canadians. Just in case. We were also not to go anywhere alone, as the travel agency would vouch for our whereabouts upon exiting Yemen. My companion had warned me that Yemeni’s never sleep. Sure enough, even at such a late hour, the shops of the city were lit. Haircuts were in process. Groceries being procured. It was probably more fully alive than Manhattan would be at a similar hour. We drove into old Sana’a and the electricity was out. The old buildings became an unlit maze connected by narrow streets. We entered a gate, walked through a courtyard, and found ourselves at a quaintly lit reception desk. From there we climbed stone stairs of unequal height to what would be in the United States the fourth floor. The door to our room resembled a cross between something from a castle and a submarine as we and to step up and duck at the same time to get inside. We opened the windows and shutters to get some air. A single fluorescent bulb powered by a generator lit the room. Even with such dim lighting, the room gleamed with high ceilings and stained glass windows. The car headlights from the street below danced on the ceiling in a kaleidoscope pattern. I collapsed into bed. My traveling companion picked up the English language leaflets on Islam for nighttime reading. He read some of it aloud until finally the light went dead, some unseen figure had declared bedtime. We could see nothing but darkness and shadow from the window. I finished my water from the car ride and stared at the missing view. The sounds of life out there matched those of any other city and I knew in the morning there would be an amazing view upon waking. Our first wake-up call came with the early call to prayer. I had grown accustomed to them in Djibouti but here… It sounded like the mosque was right outside our room. My traveling companion closed the windows, as it was not quite dawn, and we went back to sleep. When the sun bathed our room, we stirred. I again stared out the window. The buildings, so old, stood like sandcastles decorated with icing. We dressed (I fashioned a hijab) and went down for breakfast in a different courtyard. The meal consisted of local bread (like a cross between a pita and an English muffin), a couple varieties of cheese, butter, jam, tea, and yogurt with the best, richest, most vibrant honey I’d ever eaten. The other patrons of the hotel were European. A family including two children. I’ve forgotten whether they were Slovenian or Armenian or something else. If I had been nervous about visiting Yemen, it faded. Do go! I can’t wait to see more. I have more to write but have to move on for today. Maybe this evening or tomorrow I will write more.